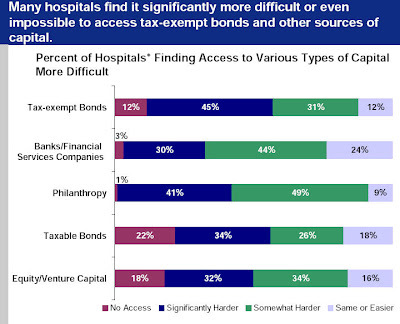 "Hospitals primarily rely on borrowed money, philanthropy and reserves to fund capital projects to improve their ability to meet communities' health care needs, but many now find it difficult to obtain funds from these sources. 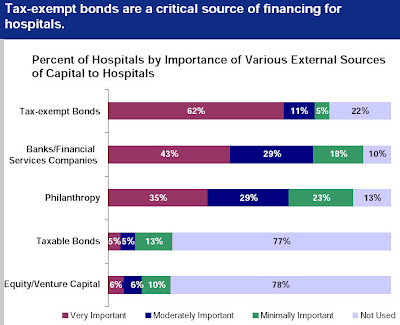 The vast majority of hospitals report that borrowing funds through tax-exempt bonds - the main source of borrowing for most hospitals - is difficult or impossible. In addition, loans from banks or other financial institutions are similarly difficult to obtain. Hospitals' reserves, or savings, also have taken a hit due to falling stock prices, net income is down and philanthropic donations have slowed, leaving hospitals with less of their own funds to rely on to make needed improvements. 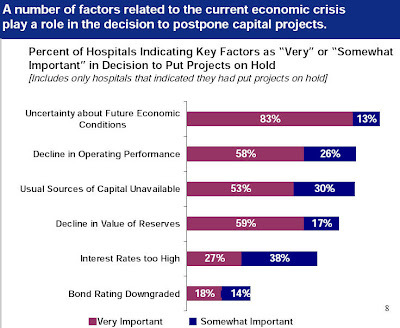 Nearly half of hospitals surveyed have postponed projects that were to begin within the next six months and many have stopped projects that were already in progress."